Lock in a great price for Hotel Indigo San Diego - Gaslamp Quarter – rated 8.9 by recent guests! Modern, clean, comfortable rooms with nice decor and an over all pleasant atmosphere. I stayed in a double room that was very clean. My last night I was in a single room and there was hair on the bathroom floor, very dusty. Very nice front staff-excellent customer service-as well as valet. Beautiful room. Was staying for one night, tired and not planning to leave the room so concierge upgraded my room just because. Will recommend and stay again when I’m return to San Diego. Everything! When I checked in the staff was friendly. Super nice and clean I enjoyed my stay. Staff went above and beyond to make sure we had an awesome stay. Just very clean and could see the ball park from room. Awesome experience. The hotel staff was great! The food in the restaurant was delicious. Our room was very nice and large. The location can’t be beat. I highly recommend the hotel. Exactly staff and amazing service. The room was surprisingly better compared to most hotels. Walking distance to most of downtown. Rooms were nice. Staff was very friendly and helpful. Rooftop area was nice. Hotel Indigo San Diego - Gaslamp Quarter This rating is a reflection of how the property compares to the industry standard when it comes to price, facilities and services available. It's based on a self-evaluation by the property. Use this rating to help choose your stay! One of our top picks in San Diego.Overlooking Petco Park and less than 1 miles from the San Diego Convention Center, this Gaslamp Quarter hotel features unique guest rooms with contemporary amenities and a restaurant on site. Guest rooms at Hotel Indigo San Diego - Gaslamp Quarter feature hardwood floors and plush bedding. Guests can also enjoy 37-inch flat-screen TVs and iHome clock radios. After a long day exploring the city, guests can use the in-room, free wireless internet access or order a meal from the hotel's 24-hour room service. Phi Bar & Bistro, the hotel's casual restaurant, is open for breakfast and dinner with stunning views of the city. With facilities such as a 24-hour fitness center and an on-site business center, the Gaslamp Quarter Hotel Indigo ensures a comfortable and productive stay. When would you like to stay at Hotel Indigo San Diego - Gaslamp Quarter? Room features a flat-screen TV, an iPod docking station and ironing facilities. 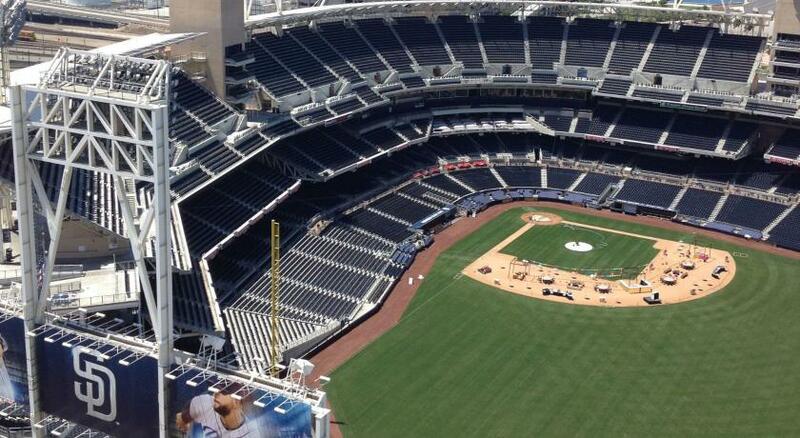 This room features views of the city or Petco Park. This air-conditioned room features a flat-screen cable TV with pay-per-view channels, an iPod docking station and a work desk. Please note that bookings which include breakfast are valid for up to two adults maximum. House Rules Hotel Indigo San Diego - Gaslamp Quarter takes special requests – add in the next step! Hotel Indigo San Diego - Gaslamp Quarter accepts these cards and reserves the right to temporarily hold an amount prior to arrival. The breakfast rates are for 2 adults and additional fees are applied for additional guests. Please contact the property for more details. A previous guest left some clothing under the bed that housekeeping hadn't found before we checked in; that was a little disconcerting. This is a lovely hotel with very welcoming staff and a good restaurant. No pool or hot tub, but we knew that prior to booking our stay so it was not a surprise. Clean, friendly staff and perfect location. The food and drinks were not a good value. We could hear the television and alarm in the next room. I suspect the hard surface flooring in the room allows more sound to pass between rooms. The lobby, corridors and room is beautiful. Very nice layout, quality of finishes and decoration. It was comfortable and welcoming.